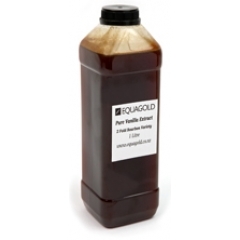 Equagold Pure Vanilla Extract. 1 or 2 fold 1lt. Home > Vanilla & Saffron > Equagold Pure Vanilla Extract. 1 or 2 fold 1lt. Pure Vanilla Extract in 1 litre PET bottles. Water 65%, Alcohol 35% and Extracts of Tahitian or Pacific Bourbon Vanilla Pods - cold press production, available in single fold and 2 fold strength.